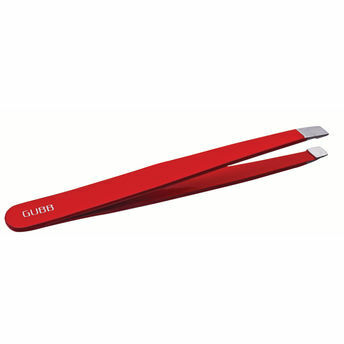 GUBB USA slant tweezers have perfectly aligned finished tips with a stainless steel and matte red color finish. Tweezers help you to maintain those immaculately curved eyebrows by eliminating all those rogue hairs which seem to appear in the most awkward places. The slant tip offers an angled, flat edge that's great for tweezing large areas quickly. It's perfect for shaping eyebrows because, whether you use the entire flat edge or just the tip portion, the angle allows you to easily see where you're tweezing while looking in the mirror. Additional Information: GUBB USA, the international grooming range from "U", is a renowned name in the field of personal skin care items and brings quality products at affordable rates. Try GUBB USA slant tweezers today and see the difference! Explore the entire range of Tweezers available on Nykaa. Shop more GUBB USA products here.You can browse through the complete world of GUBB USA Tweezers .